"Sorcerer Kings - Part 2"
Detective Chimp, Doctor Occult and Batman are outside a creepy, kooky, all together ooky house that, according to Occult's intel, is the home of Acolytes of the Void. Batman, trusting the intel, breaks in and takes on the members inside. They try to fight back with their magic but it turns out that the person behind their power lied because their "powers" turn out to be nothing more than parlor tricks. Batman finally gets one of them to talk and learns that while the man giving up the information doesn't know who the higher ups are he does know that Batman will never stop them. Not even the ancient ones could destroy the spell, so they divided it up into a thousand different places. Eventually they knew the final spell would be found and once it is they will walk the Witch's Highway and perform a ritual that will allow them to cast their oppressors into eternal torment. After he is done Batman asks Dr. Occult what the Witch's Highway is. Occult explains that it is a central pathway connecting all of the mystic wellsprings, places where the very essence of magic bubbles up. Batman explains that they need to find it leading Occult to say that if they are going to find the highway they will need a witch. In the future Batman explains that the sword the future Superman was carrying was a beacon which allowed them to track it down and bring the Superman from the present forward in time. Batman explains that the world died when a coven of the most powerful magic users (Blackbriar Thorn, Morgan Le Fay, Brother Blood and Felix Faust) enacted the Final Spell and offered up the sun for limitless power. The magic using heroes tried to undo these effects and eventually breathed new life into the sun but the cost was high. All technology had been wiped out and demons roamed free. A voice calls out for Batman to tell Superman the rest, how magic now rules supreme. The voice is that of the Creeper, who is one of the Coven's assassins and leader of the Corpse Gardens, an army of undead monsters. The battle is brutal and early on Superman learns that his powers don't work as they should. Batman tells him to use the sword and when the Man of Steel finally does it sends the Creeper and his crew away in a flash of light. Under the new sun Superman has new powers and apparently this is one of them. Back in the present Dr. Occult, Detective Chimp and Batman follow a pathway into the sewers, which take the group to Klarion the Witchboy. Story - 4: Despite not liking the first chapter of this story I enjoyed this issue. 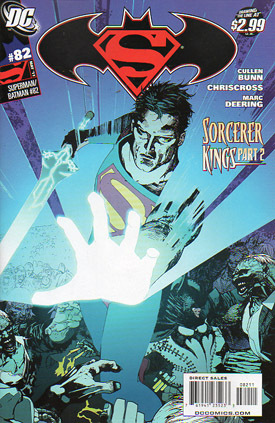 I am still not the biggest fan of magic based stories featuring Superman but there was a lot to like about this issue. The first scene had good dialogue and solid if sometime wonky action. Cullen Bunn has a good handle on Batman and showed this with the Dark Knight's lack of fear at the "magic" being thrown at him. I especially liked that Batman didn't discount the very existence of magic, just the ability of the Acolytes to use it with anything even close to resembling skill. I also liked the fact that Bunn brought in Doctor Occult. Even though he didn't share any "screen time" with Superman it is always nice to see another Jerry Siegel and Joe Shuster creation. Occult's characterization was spot on, especially the line, "And it wouldn't be the first time I have gone looking for something doesn't exist." It grounded Occult and made him seem very human despite being a magic based character. The scenes in the future were entertaining as well. Again the magic based elements keep me from absolutely loving the story but the explanation as to why the future is such an awful place was solid and brought in some of the usual suspects when it comes to evil magic as well as a 5 percenter like Blackbriar Thorn. Bunn obviously has a love for the DCU and it shows in this story right down to having the Creeper not only a part of the story but the leader of the Corpse Garden. It hit me while reading this issue that the inclusion of these characters makes this story feel like a true SUPERMAN/BATMAN story. While I still hold to the theory that Superman teaming up with Batman stories work best once a year the better stories this title has had to offer are ones where the most random characters show up. Bunn is certainly giving us that and I applaud him for it. The one element that took me out of the story was Superman banishing the Corpse Garden with his magic sword. It was a neat scene and Bunn built to the moment nicely but I heard the theme to the eighties version of HE-MAN AND THE MASTERS OF THE UNIVERSE playing in my head and Superman shouting, "I HAVE THE POWER!" as he lifted the sword into the air. Then again Superman teamed up with He-Man one or two times and I do own the SUPERMAN/HE-MAN two pack of figures that Mattel released some time ago, so maybe it works after all. I am going to hold off the final verdict on Klarion the Witchboy joining the story until later. He was never a character that appealed to me but Bunn might do something interesting with him so I shall wait and see. While I am not completely sold on this story I did like this chapter better than the first one and hopes this continues to be the case with the rest of the arc. Art - 4: I dug the art this time around. Batman looked a little wonky as he was breaking in to the house at the beginning of the issue and that one shot of the guy with the knife getting an armful of batarangs was a bit off but other than that ChrisCross did a solid job on this issue. The moodiness of the beginning of the story was spot on and the action scenes were very dynamic. I have very few bad things to say about the art this time out. Cover Art - 2: This is another one of those covers that from an artistic standpoint is fine but from a personal aesthetics standpoint is not to my liking. I don't like scratchy art. I can see where this cover has a lot going for it but I can't get past the style.